Representatives from BAE’s York County facility joined with the York County House Delegation, and the chairmen of the House Veterans Affairs and Emergency Preparedness Committee to commemorate the successful adoption of the House resolution urging the Secretary of the Army to reconsider temporary production of the Bradley Fighting Vehicles. HARRISBURG – Standing up for York County residents who help keep our servicemen and servicewomen as safe as possible in the line of fire, the York County House Delegation supports House Resolution 597, which urges the United States Army to reconsider temporary suspension of Bradley Armored Fighting Vehicle (BFV) production. The resolution was unanimously adopted today by the state House of Representatives. 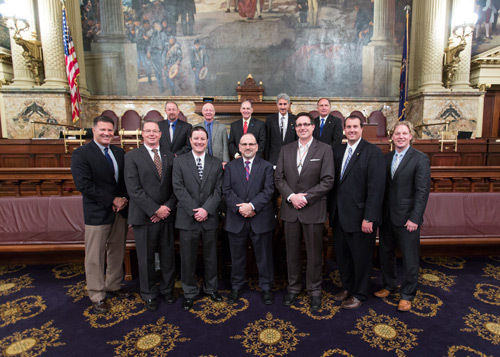 Authored by Seth Grove (R-Dover) and co-sponsored by Reps. Keith Gillespie (R-Hellam), Ron Miller (R-Jacobus), Mike Regan (R-Dillsburg), Stan Saylor (R-Red Lion), Kevin Schreiber (D-York) and Will Tallman (R-Hanover), the resolution comes in response to an announcement from the Pentagon that Bradley Fighting Vehicles (BFV) production will be temporarily stopped at the BAE Systems York County facility where the vehicles are produced. The facility employs more than 1,000 people dedicated solely to the production of the BFV, which has played a key role in the United States’ military efforts in the Middle East. A production suspension will have a negative impact on the lives of the employees who make the vehicles and the suppliers whose materials are put into BFVs. The York County House Delegation believes the vehicles play a large role in the local economy and national security, and halting production, even for a short time, is in no one’s best interest.